Mental discipline and concentration are premium for any fighter to succeed; but you must train. Your physical conditioning and fitness will determine how you will fight. Make no bones about it: in a survival situation post SHTF, you will eventually have to fight, one way or another. There will be limited food, limited water, limited resources. You will have stocked up all of your larders with racks and racks full of canned goods and dried foods…all of the best you could garner. You’ll have medical equipment, and water stored, along with tools and survival supplies. That’s great…you’re surviving, and that is the object. Your best defense is a fit body and sound mind, both trained to fight. Whatever discipline you choose to study is up to you, and should not be made hastily, or without consideration of your condition from a medical perspective. Consult with your family doctor prior to any fitness regimen or martial arts training. That being said, you can train with boxing gloves and/or bag gloves and a heavy bag and a speed bag. You can get a great workout from either, with different goals and objectives for each. Your heavy bag workout is to condition your hands, arms, and shoulders to deliver a punch. If you buy a good quality bag (I prefer either canvas or leather, with Everlast being the best), you should get one that weighs between 50-75 lbs. That will be workable. Heavier than this it’s pretty hard to move. You want one that is solid that you can also practice your kicks on. You’ll need literature and training for it that is beyond the scope of this article. You can pick up hand wraps for yourself and bag gloves, and do a good workout on that heavy bag. Try doing sets (rounds) of 1 minute for starters, with a 1-minute rest. Do three “rounds” of this. If you’re not used to it, you’ll be amazed at how it will “smoke” you. Then with time you can increase your rounds and the time for them, as well as decreasing the rest interval between rounds. For kicking, pick up some good instep pads and sole pads, and find an instructor or even someone who just exercises in this manner and pick up some instruction from them. You’ll find a lot goes into it: stretching, strength, and coordination. You don’t have to be Chuck Norris or Bruce Lee. 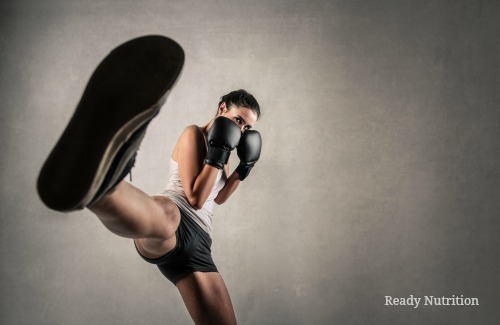 Just build a repertoire of two or three basic kicks, such as a roundhouse, a drop-kick, and a side kick for starters. Master a few and then you can build on more to expand your repertoire. The speed bag can give you a really good workout, as well as build hand-eye coordination. It helps with your timing, as the bag moves faster than a human head. Discipline and training are your keys, and they must be in conjunction with one another. Train your mind as well. There are many ways you can prepare your mind and body. The classic text by Sun Tzu “The Art of War” will seem strange if you haven’t read it; however, the principles are sound for armies and for individuals. Mental discipline and concentration are premium for any fighter to succeed. Find the best instructor you can, and make it worth his while to train you, even if it isn’t in a Karate dojo, or some large-chain gym. Find a neighbor or a friend who is good at it, and get them to take you under their wing. It’ll pay off big time for you later. To conclude, these are all training tools you can incorporate into your workout regimen with a purely practical, utilitarian facet: to prepare you for the eventuality of a fight. Remember, it’s not a matter of looking for trouble. Rather, it is ensuring you can take care of trouble when it comes if you must go that route. Avoid the fight if you can, but if you can’t? Then win it. Keep fighting that good fight, and do the best you can in all things. JJ out! Me I’m old man just shoot last man standing they can only kill me once. If they’re lucky. I’m with you Joseph. I’m 70 yrs old, diabetes, and a number of other agent orange presents. I’m too old and broke down to run. Can’t fight. But I’m pretty accurate with a hand gun, and deadly as hell with a pump shotgun. Nuff said.